Designed by Allen Architecture Interiors Design (AAID), the Publicis Media offices have an open plan concept with a free flowing layout. Pallavi Dean Interiors handed over its second major Middle East office for global communications firm Edelman. Located in the ONE JLT building, the concept was to create Cultural Villages – separate ‘cities within a city’. Mojeh, Dubai is a fashion magazine and Swiss Bureau worked for the magazine’s team to carefully structure a workspace that offered a bright, functional and well-planned interior. It was intended to stimulate creativity and reflect the brand and its ethos. SBID’s brief by the client was to have a space that was fun and trendy: a place where the staff can work, but also relax, unwind and have fun. 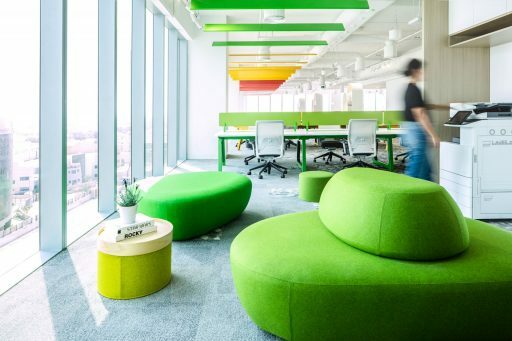 AAID was tasked to design an office space that incorporated the global branding while staying on course with a restrictive budget and project programme for the world’s paid tv programmer.The design executed a play of colour and texture within the new premises of Discovery Communications. The creative use of varying shades of grey within the carpet and stone flooring allowed an extent of flexibility to the ever growing client. M+N Architecture designed FLASH Entertainment’s snazzy new offices at twofour54. The challenge was to create a strong brand identity with a highly flexible space. This translated into an open space of 480 square metres (about half of the total project’s area), where two “snake-like tables” (58 and 22 metres in length respectively ) move between the existing columns, creating sinuous shapes.